The featured photo was taken in a market in Paris but cardi are sold in every market in all regions of Italy.. The photo below is not a photo taken in one of the markets in Italy – it was purchased from Gus and Carmel’s stall in the Queen Victoria Market (Carmel is holding the plant, she was reluctant to pose). It is a cardoon (called cardone or cardo in Italian) a close relative of the artichoke with light green to white stalks ribbed like celery. Cardoons (cardoni or cardi) are fibrous; the stringy fibres run lengthwise and need to be removed. Only the stalks are eaten and they the plant is young can be eaten raw when young. I am very excited by this because it is the first cardoon I have ever seen for sale and cooked in Australia. I was in Chanti two years ago and travelled through Tuscany when cardi were in season and I must admit that I have never seen cardoons as gigantic as the one anywhere in Italy. The other photo (see bottom of this post) showing a darker variety of cardi was taken in the market in Catania, Sicily and this is the size (not necessarily the colour) that I remember my mother buying when we lived in Trieste. 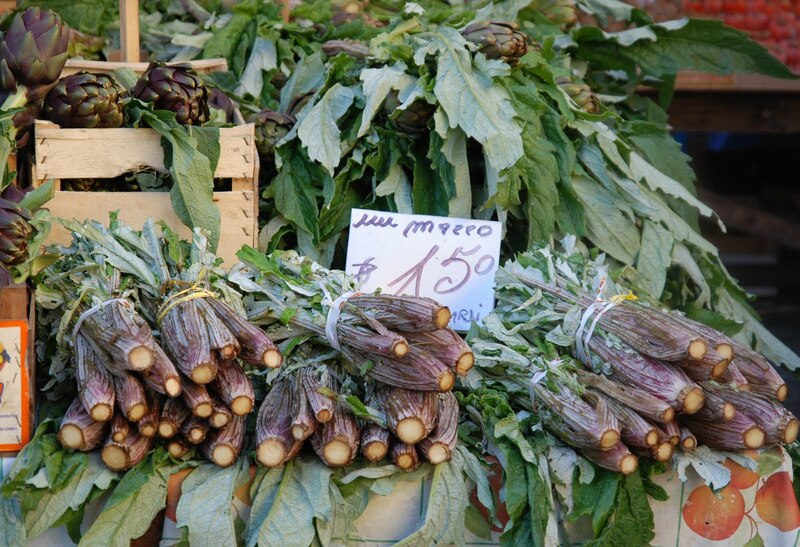 Cardoons are a winter vegetable and appreciated in all parts of Italy. I know that there are a number of varieties of cardi but they can be grouped into two sorts. 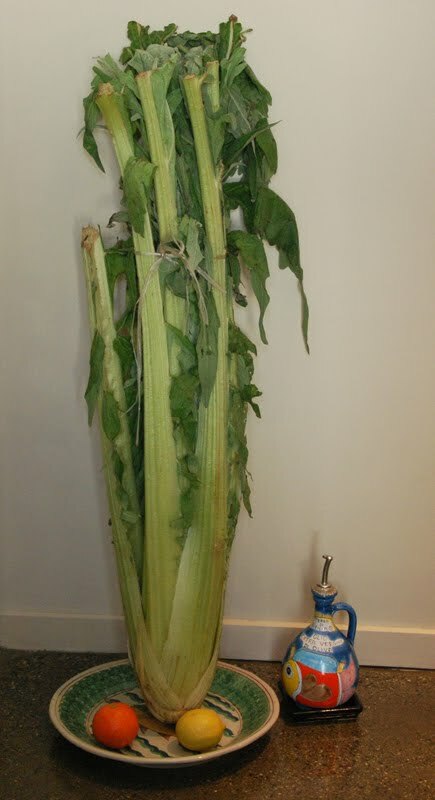 One grows straight and long (60 to 150 cm), and I guess that this is what I have (it is 110cm tall, and the top leaves have already been trimmed); the other cardi are curved and in Italy are known as the gobbi (hunchbacks). The best cardi are grown blanched. This is like the blanching of some celery – the plant is tied together and paper or boards are used to block out the light and shade the stalks. When the light source of celery is blocked out the plants lack green colour, the stalks are generally more tender and are sweeter in taste. Apparently the best cardi are grown in total darkness; to blanch the gobbi, the plants are bent on one side and covered with earth; this contributes to the typical arched shape. When my family settled in Australia we missed our cardi and my mother cooked the ivory stalks of silver beet the same way, i.e. gratinati – au gratin (part boiled and then baked with béchamel and parmesan cheese). She also part boiled them, crumbed and fried them (called impanati). My mum has never worked and was particularly bored when we settled in Australia, where in fact she developed her best cooking, even if she did not have the range of ingredients. We knew that the silver beet stalks would never taste like they should (similar to artichokes), but they looked good when we were having guests. Gus is Calabrese and the fruit stall next door is also run by Calabresi. 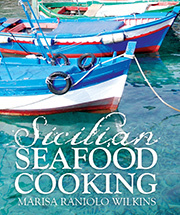 They tell me that one of their favourite ways to eat cardi are when they are preserved in extra virgin olive oil. They are boiled first in acidulated water, drained well and like when preserving carciofini (small artichokes) are then covered with oil, salt and perhaps some dried oregano. In Tuscany the cardi are often recooked in chicken or veal stock and in Piedmont they are precooked and then presented with bagna caoda (a warm dip of anchovies, garlic, and olive oil, usually served with fresh vegetables as an appetizer). To clean cardi, take off the outside leaves and any that are discoloured or soft until you reach the inside of the plant. As you can see in the photo the plant was significantly reduced in size and looks very much like the centre of a celery. With a sharp knife strip off the coarse, outer, stringy layer of fibres – some people use a potato peeler to do this. I do the same with artichoke stalks and like artichokes they need to be placed in lightly acidulated water as you are cleaning them. 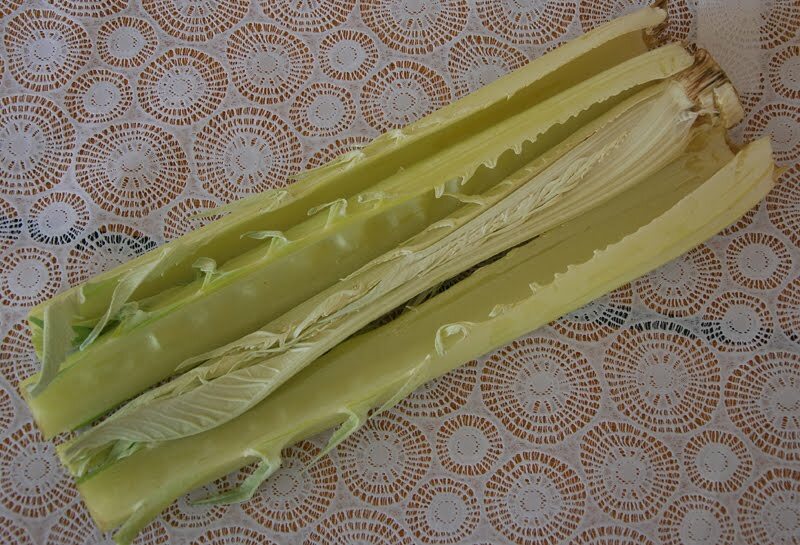 The cardoons are then cut into 5-6 cm pieces and are partly boiled to remove more of their bitter taste, and then recooked. A good squeeze of lemon juice added to the cooking water will also help to prevent them from darkening. Do not think about reusing the cooking water as stock – it is bitter. Clean and cut the cardi to size, place them into boiling, salted water and lemon juice and cook till softened. The cooking liquid should completely cover the vegetables. My cardi remained slightly crunchy and I cooked them for 35-40 mins. Some cardi can take a long time to soften and some of the recipes I read suggested a couple of hours cooking time. Drain well. 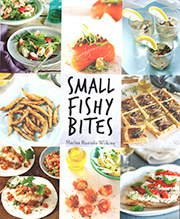 If you intend cooking them later keep them in the cooking water till you are ready for the next cooking stage. Grease a wide, shallow ovenproof dish with butter and place a layer of the cardi in it (there will be two layers). Cover with some of the béchamel (besciamella) and half of the parmesan. Continue with the second layer of cardi, followed by the béchamel and cheese. At this stage you can decide if you would like to sprinkle some coarse breadcrumbs made with good quality bread (sourdough or pasta dura) on the top of the cheese and dot the crumbs with some bits of butter. Bake in the oven for 20-30 minutes or until the surface has turned a golden brown. Serve at once.